Government fixed income securities, including German and Japanese 10-year securities, sold off across the globe overnight, and the yield on the 10-year U.S. Treasury moved above 3.2%. 10-year Treasury yield rises above 3.2%. Data show strong U.S. job creation, services sector. Bank stocks get lift Wednesday, but utilities, real estate, consumer staples falter. (Thursday Market Open) Stocks seem to be yielding to bonds at the moment. Government fixed income securities, including German and Japanese 10-year securities, sold off across the globe overnight, and the yield on the 10-year Treasury moved above 3.2%. The move in the 10-year Treasury comes after stronger-than-expected reports on private-sector payrolls and the U.S. services sector and comments from Federal Reserve Chairman Jerome Powell that were upbeat on the U.S. economy and seemed to reaffirm that more rate hikes are to come. The higher the 10-year Treasury yield moves above the psychologically important 3% mark, the less attractive stocks can become as equities are considered by many to be more risky than government bonds. There’s less of a need to “reach for yield" in the stock market if there’s yield in bonds, so the theory goes. Although each of the main three U.S. indices ended Wednesday higher, each closed off their highs for the day, perhaps on concerns about higher rates potentially increasing corporate borrowing costs and on worries that the stronger-than-expected economic data might become a factor for the Fed potentially hiking rates too aggressively. The end-of-day weakness spilled over into Thursday morning. One thing that only time will tell is whether Treasury yields this time around will remain meaningfully higher for a longer time. Higher yields aren’t all doom and gloom for stocks. The financial sector yesterday tied energy as the S&P 500’s (SPX) biggest gaining sector, as government debt yields rose. Rising rates can help banks make more money by charging more on loans than they pay out on deposits. But while the higher yields seemed to boost the financial sector, they also seemed to pressure so-called “bond proxy” stocks, with utilities, consumer staples and real estate notching the day’s biggest S&P 500 sector declines. Those stocks tend to falter as interest rates rise. 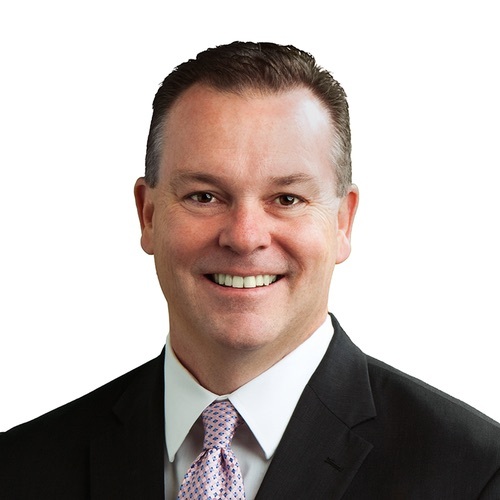 They generally have a track record of strong dividend payments and solid growth, making them competitive when bond rates are low and investors are seeking yield. As yields rise, these stocks, which are considered riskier than bonds, tend to become less sought after. But overall, the U.S. stock market has been doing well despite the rate hikes we’ve seen and expectations for future interest rate rises. If that trend continues, we could see money shift into U.S. stocks and bonds at the expense of some overseas markets. Meanwhile on Wednesday, the energy sector tied financials for the strongest performing of the SPX sectors. Oil prices appeared to get a boost from concerns about supply after sanctions on Iran take full effect early next month. It’s possible that crude’s rise was tempered by a government report showing that U.S. crude stockpiles rose more than expected, but the benchmark U.S. crude futures contract (WTI) still gained 1.6% while the international benchmark, North Sea Brent, rose 1.8%. While higher oil prices can be a boon for producing companies, they can be a headwind for airlines, freight transportation companies and manufacturers. And when consumers have to pay more for gasoline, they can forgo other purchases, potentially dinging consumer discretionary companies. Drilling down further, the WTI-vs-Brent spread has been something worth watching. As the world weighs the effects of output in the U.S. versus those of OPEC members, as well as the effects of U.S. sanctions against Iran, Brent has surged more than WTI (see figure 1). The spread between the two, which earlier in the summer had narrowed to about $5, widened out to $10 as of this morning. FIGURE 1: DRILLING DOWN ON WTI-BRENT. 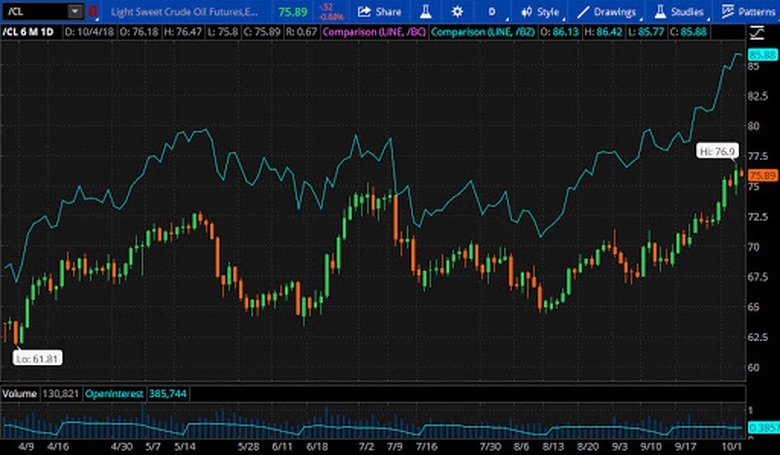 A few months ago, the spread between West Texas Intermediate (WTI - candlestick chart) and North Sea Brent (blue line) crude oil was about $5. Today the spread sits at $10. Chart source: The thinkorswim® platform from TD Ameritrade. For illustrative purposes only. Past performance does not guarantee future results. Jobs Preview? If Wednesday’s private-sector payroll report from Automatic Data Processing (ADP) and Moody’s Analytics is any indicator, the market could see a stronger-than-expected number from the closely watched government jobs report on Friday. 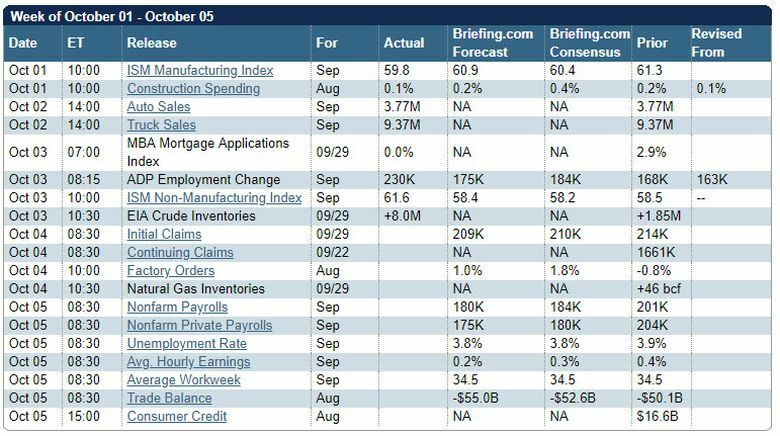 The ADP report showed that 230,000 non-government jobs were created in September, well above the 184,000 expected by a Briefing.com consensus of economists. That could bode well for the Friday numbers from the government, which are expected to show a gain of 184,000 in non-farm jobs, according to a Briefing.com consensus. If the actual number comes in ahead of expectations, that could add fuel to speculation that the Fed may hike rates more aggressively and potentially put a damper on stocks. On the other hand, stronger-than-forecast jobs growth is also a strong sign for the economy, which could argue in favor of continued gains in equities. Services Sector Strong:Data from the Institute for Supply Management on Wednesday painted a picture of a robust U.S. services sector in September. The ISM’s non-manufacturing index, which is based on information from purchasing and supply executives, rose to 61.6, the highest reading for the composite index since its inception in 2008. According to the ISM, the historical relationship between the index and the general economy indicates that September’s reading corresponds to a 4.6% gain in annualized real gross domestic product. “The key takeaway from the report is that it clearly indicates business activity is strong for the service-providing sector of the economy, which accounts for a much larger slice of economic activity than the manufacturing sector does,” according to Briefing.com.